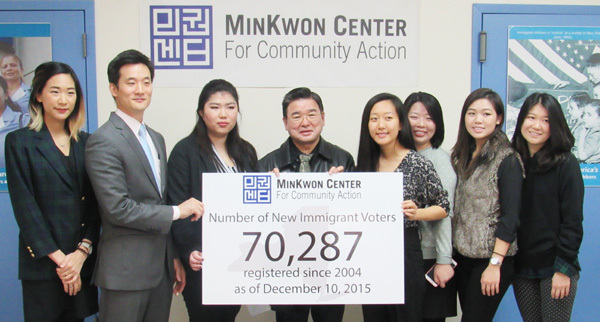 The MinKwon Center for Community Action in Flushing has reached a milestone, having registered more than 70,000 new immigrant voters citywide as part of its civic participation program. Since 2004, the center has registered 70,090 immigrant voters to date, it announced at a news conference Dec. 17 at its office at 136-19 41st Ave. City Councilman Peter Koo (D-Flushing) attended the ceremony. The voter registration efforts are based on extensive street outreach, registering walk-in clients and running a year-round campaign targeted toward new immigrant voters in partnership with the New York Immigration Coalition. The initiative targets immigrant groups generally, according to James Hong, MinKwon’s director of civic engagement. Hong said that in light of upcoming elections, the center is trying to increase the number of registered immigrant voters as well as the pace at which it gets them registered in light of upcoming elections—congressio­nal and presidential primaries and the general election in November. He remarked that many people in the Asian-American community are not aware of the fact that you have to be enrolled in a political party in order to vote in a New York state primary. The center’s New Immigrant Voter Registration campaign is part of its comprehensive civic participation program aimed at engaging and empowering voters in the Korean-American and immigrant community through voter registration, education, mobilization and protection. As a leading organization in APA VOICE, a coalition to increase civic engagement in the Asian Pacific American community, MinKwon has encouraged voters to participate in numerous elections in 2015. In preparation for the 2016 elections, MinKwon will amplify ongoing efforts to register more voters to meet the March 25 deadline for presidential primaries.